Background: Clostridium botulinum having capacity to produce botulinum toxin (a potent bioterrorism agent) causes a fatal food borne disease "botulism" which is a major threat to public health globally. Most of the treatments and vaccines available for Clostridium botulinum are not effective enough to cure these infections. Therefore, there is an urgent need to look for more potential vaccine candidates by employing quick and cost effective methods. Even in the past decades enormous efforts have been put for the development of computational tools including Reverse vaccinology which were successfully used as landmark for discoveries in relevant scientific fields. 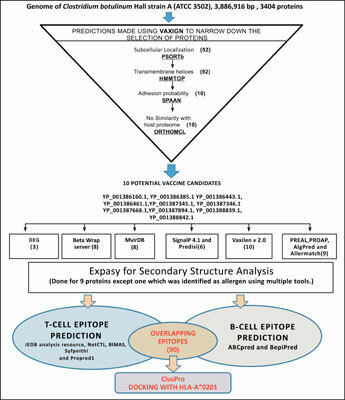 Objective: The present article dealt with the employment of in silico based approaches of Reverse vaccinology for the identification of antigenic epitopes/peptides of Clostridium botulinum Hall A strain from its sequenced genome to consider them as potential vaccine candidates. Method and Results: After screening whole proteome on the merit, epitopes belonging to the top five proteins having accession numbers YP_001387668.1 (NlpC/P60 family protein), YP_001386461.1 (NlpC/P60 family protein), YP_001388839.1 (N-acetylmuramoyl-Lalanine amidase), YP_001387894.1 (hypothetical protein CLC_2047) and YP_001386160.1 (sporecortex-lytic enzyme) were selected for further computational characterization. These proteins were predicted to be surface exposed, nonallergic, essential, virulent and antigenic in nature. The binding efficiencies of these epitopes with HLAA* 0201 have also been visualized by docking tools. Conclusion: The predicted epitopes can be the good candidates for synthesizing a peptide vaccine that can elicit an efficient immune response in the host against the pathogen. Detailed characterization of such pathogen specific molecules as vaccine candidates (immuno-protective agents) would be beneficial for designing better treatment strategies against botulism. Keywords: Clostridium, botulinum, epitopes, in silico, reverse vaccinology, vaccine candidates. Keywords:Clostridium, botulinum, epitopes, in silico, reverse vaccinology, vaccine candidates. Abstract:Background: Clostridium botulinum having capacity to produce botulinum toxin (a potent bioterrorism agent) causes a fatal food borne disease "botulism" which is a major threat to public health globally. Most of the treatments and vaccines available for Clostridium botulinum are not effective enough to cure these infections. Therefore, there is an urgent need to look for more potential vaccine candidates by employing quick and cost effective methods. Even in the past decades enormous efforts have been put for the development of computational tools including Reverse vaccinology which were successfully used as landmark for discoveries in relevant scientific fields.